Many people who’ve had a near-death experience describe it as a much stronger experience than a dream — more “real than real life,” a moment that forever changes them as a result. But is this the work of some grand spiritual force, or is it just your brain dousing itself in feel-good chemicals before it logs off forever? 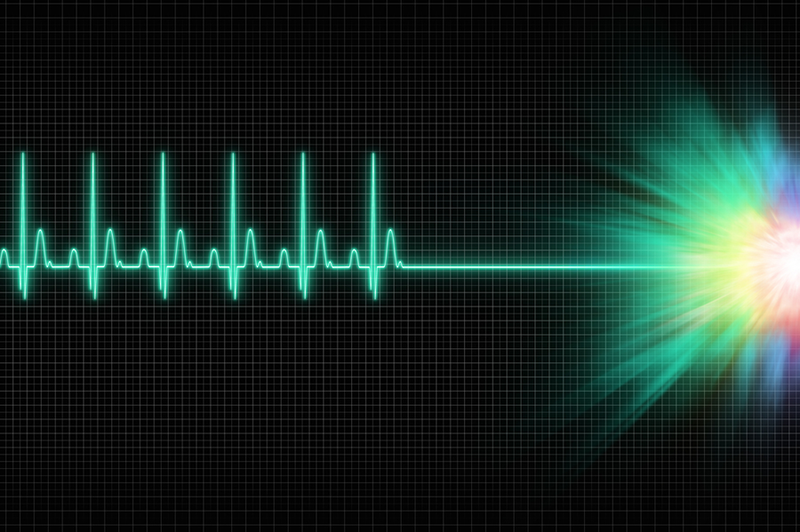 To find out, I had Jimo Borjigin, associate professor of neurology and associate professor of molecular and integrative physiology at the University of Michigan, and Susan Blackmore, psychologist and author of Dying to Live: Science and the Near-Death Experience, explain what’s really happening during that flatline. Another possible explanation comes from a 2013 study on dying rats at the University of Michigan, which found the oft-reported deathbed vision may be caused by the narrowing of one’s field of vision. This happens when blood and oxygen are depleted from the eye as a side effect of experiencing extreme fear, aka, how you’d guess most people feel when they’re that close to death (or how most rats feel when they see a guy in a lab coat). One of the most common near-death experiences is feeling yourself leave your body, floating above and looking down upon your mortal visage, eavesdropping on the doctors panicking around you. This, though, is as much of a mirage as the white light. Even before cardiac arrest begins, the human brain can sense there’s something wrong, and attempts to save the heart by “sending it a load of goodies,” explains Borjigin. A similar situation arises in sleep apnea — the brain senses a drop in blood-oxygen because the sleeper stops breathing. The difference here is that your brain is able to lurch your heart into action and wake up during sleep apnea. “Basically it’s a mismatch between what your brain is telling you, and what your body system can do during cardiac arrest,” says Borjigin. In normal circumstances, your brain has a carefully crafted sense of “self,” exquisitely tracking every movement while forecasting what’s coming next to physically prepare the body. “Under normal conditions, let’s say you’re being chased by a tiger. Your brain tells your legs and heart to speed up, and your only choice is to run really fast to get away,” says Borjigin. “In that situation, your whole body is coordinated: Your brain is telling the heart to pump more blood to your muscles to run faster — everything is in synch to achieve the goal of escaping the predators. Or in layman’s terms, it’s just a glitch in the way you process sensory information. Before being dragged back into their fleshy prison, those who’ve crossed over report feelings of euphoria, like they’ve been imbibed with a universal knowledge and the infinite love of the universe. I’ll have what she’s having, amiright? Whether it’s communication with dead family members and friends, or faceless spiritual entities, many near-death experiencers will encounter nonverbal communication that, much like the euphoria, is felt on a non-physical plane of existence. So if religion is a huge part of your life, it’s not so strange that your brain would dig up your memories of important religious figures to inspire you to keep fighting. All in all, we’ve barely scratched the surface on how the brain reacts to death. “Hopefully future research sees this as potential way to save dying patients, as more people start to understand that the brain has a major role in a dying human,” says Borjigin. Until then, however, near-death experiences will remain a mystery — for most of us, at least.